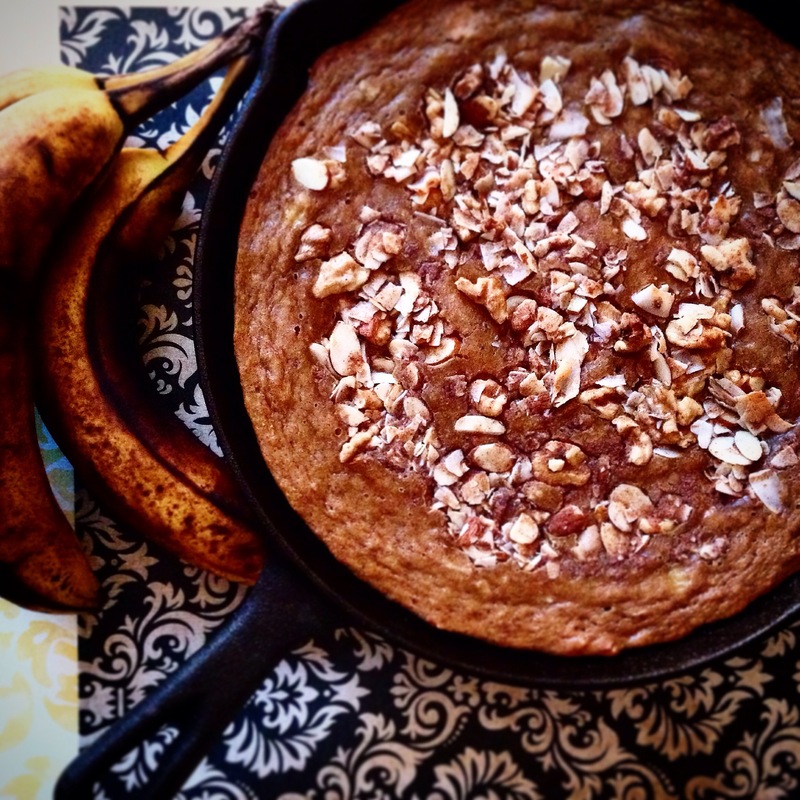 Skillet Saturdays: Gluten-Free Banana Bread! I’ve been gluten-free for a couple of years now, and apart from the holiday cheats or the odd organic sourdough sandwich or Jamaican Ginger Beer, I remain pretty true to it. However, I don’t support a lot of the ingredients in gluten-free alternatives (non-organic soy and/or corn, chemical additives, etc) and I also don’t like the texture and flavors of many gluten-free breads and baking, so I rarely have either. Except this. And a Pumpkin Spice Bread that I’ll post the recipe for soon too. I’m not big into baking yet. I find that there is much less flexibility with baking, as opposed to cooking, and I really like casualness in the kitchen. This recipe is quite simple and fits a skillet perfectly. Though this seems like more of a treat than a health food, it is high in fiber, protein and healthy fats and is a great part of breakfast or a midday snack when the energy starts to fade. Coconut flour is a great ingredient. It is dried coconut meat milled into a flour. It has the moisture (milk/water) removed and the high amount of fiber remains, as well as the protein. At first you might be weirded out by the ratio of wet to dry ingredients. Coconut flour is very porous and absorbs a lot of liquid. It is an awesome grain-free alternative and has a lovely flavor and aroma. Turn oven to 350F and grease the skillet well with coconut oil. Mix in all other ingredients from part one. Blend well with a wooden spoon or whisk. In a separate bowl sift together ingredients from part two. Gently stir in part two (dry) ingredients into part one (wet) ingredients. Don’t stir too much but make sure there are no powdery balls. Melt the Coconut oil from part three, on low, in a small pot on the stove. Once melted, remove from heat and stir in remaining part three ingredients. Ensure everything is evenly coated. Pour batter into the skillet and jiggle to flatten evenly. Scatter part three ingredients on top. Put in the oven and bake for about an hour. Please be sure to watch the edges. You may have to move the skillet to a lower rack for the last 20 minutes. Put a toothpick through the center to ensure it’s cooked through. Enjoy! Maybe with a nice cup of quality coffee or a Chai tea! The amount is missing for the coconut sugar in part 3. I’m assuming it’s meant to be 1 tablespoon.